Roller Shutters will not only look good, but with the increased security, lower heating and cooling bills – and less interior damage from the harsh effect of the sun – they will easily add value to your investment property too! Two properties in the same location, one with Roller Shutters and one without. Which one will earn the landlord a higher return on investment? Each individual slat of the roller shutter is engineered in such a way that small gaps set between the slats allow gentle summer breezes and a delicately filtered light to flow through. For more light and breeze, the shutter can easily be adjusted to any height position on your window giving you full control of a home’s temperature and privacy. Today’s tenant wants to protect their family as much as you do. Roller Shutters have been proven to reduce the amount of traffic and neighbourhood noise entering homes by up to half. This can be the difference between a vacant rental property and a fully let one, with higher rental returns. 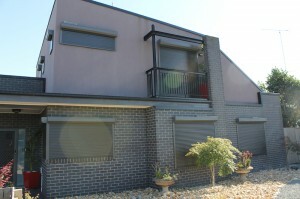 Roller Shutters have also been proven to reduce heating bills and the need for air-conditioning. Medium to long term tenants are mindful of energy costs rising and will chose a lower cost property over others in the same location. Roller Shutters are not only a physical barrier but a psychological one as well. Time and again thieves chose other properties over those which have been reinforced. Check with your Accountant and they will tell you Roller Shutters may be able to be claimed as a tax deduction for your Investment Property. Fill out the contact form and we’ll get back to you ASAP about adding that much more value to your investment property via a Roller Shutters installation!